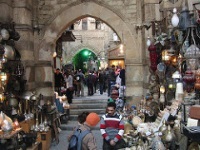 Buzzing with enthusiastic buying and selling, Khan al-Khalili is one of the largest markets in the world. Situated within Islamic Cairo, the World Heritage Site attracts travellers and locals alike. On the northern corner of the bazaar is the Mosque of Sayyidna al-Hussein, one of the holiest Islamic sites in Egypt. The market is the best place to soak up the colour of Cairo and to people-watch and the streets themselves are charming with arches, carvings and mosaics. You will get many amazing photo opportunities wandering the labyrinthine little streets, just be sure not to get lost! Traders have been bargaining in these alleys since the 14th century and it is possible to buy almost anything, from exotic perfume bottles to everyday Arabic clothing. There is, of course, a lot of junk as well but treasures and great bargains can be found. Be prepared to barter as the prices originally stated will always be much too high and the merchants expect you to negotiate. Although some of the traders are delightful others can get pushy and rude. Unfortunately, women travelling alone will almost certainly have to put up with a certain amount of harassment. No matter how many times you visit this vibrant market you will always find something new and enchanting, just keep a careful eye on your wallet.